Just yards away from the Branson Craft Mall are Branson’s largest wineries, key elements of the ultimate Ozarks experience. Since German immigrants settled Missouri beginning in the early 19th century, the Show Me State has seen its own booming wine culture. Visitors can find most any variety of Missouri wine in Branson, and they can also try varieties they’ve never before experienced. One of Branson’s most popular attractions, Stone Hill Winery has offered thousands of daily visitors tours and tastings since its 1986 opening. Established in 1847, well before there was a Napa Valley wine industry, Stone Hill soon grew to be the second largest winery in the United States. Stone Hill wines were world renowned, winning gold medals in eight world’s fairs, including Vienna in 1873 and Philadelphia in 1876. By the 1870s the winery was shipping 1.25 million gallons of wine per year. Today, Stone Hill’s yearly production is approximately 300,000 gallons of wine, using state-of-the-art equipment and the latest technology. Stone Hill’s winemaking team produces wines that are again receiving international acclaim. Winning more than 4,000 awards since 1991, Stone Hill Winery has continuously ranked among the nation’s top award winners. The Branson offshoot of Missouri’s oldest winery, Stone Hill offers guests free tours and tasting rooms, as well as a gift shop. Immediately upon entering the location, Branson visitors observe an enormous grape press dating to as early as the 1830s. Used to press grapes in eastern Missouri during the early days of Missouri’s wine industry, the wooden bin could hold as much as 2,000 pounds of grapes as two people would turn the iron wheels on either side to press a huge wooden disk into the grapes, extracting their juice. Stone Hill Winery may not use traditional equipment anymore, but visitors to the Branson location are invited free tours of the facility, learning how the modern vintner extracts juice from grapes grown in its Hermann, Mo. vineyards, and turns it into wine. While there, they can sample various wine and juices in any of six tasting rooms before shopping for their favorites in Stone Hill’s gift shop. Mount Pleasant Winery’s rich history is a testament to Missouri’s long-standing contribution to the global wine industry. In 1859, two brothers from Germany established Mount Pleasant Winery as a commercial wine business. They built the cellars in 1881, using the wood and limestone from the area. Those cellars are still used today to age Mount Pleasant’s estate-bottled wines and internationally award-winning Augusta Ports. Today, Mount Pleasant wines features 12 grape varieties grown on 78 acres in Augusta, Mo. Mount Pleasant’s Branson location, opened in 2008, features a tasting and bottling experience perfect for the connoisseur of Missouri wines. Mount Pleasant patrons can choose from a number of the winery’s award-winning wines and even bottle their own from a specially-designed 600-gallon French oak barrel. Mount Pleasant also offers a Wine 101 class, where visitors can learn the art of wine tasting that is sure to enhance their appreciation of both wine and winemakers. For $15 per person, they are guided through the ways to use their basic senses to properly taste wine, while they also learn how to properly pair various wines with different foods. At the end of the course, visitors even receive a complimentary Mount Pleasant wine glass as a souvenir. Those who prefer to simply sample Mount Pleasant’s wine varieties can partake in a free tasting experience in which they are invited to try various wines ranging from dry to sweet as they learn about the varieties of Mount Pleasant’s wines. 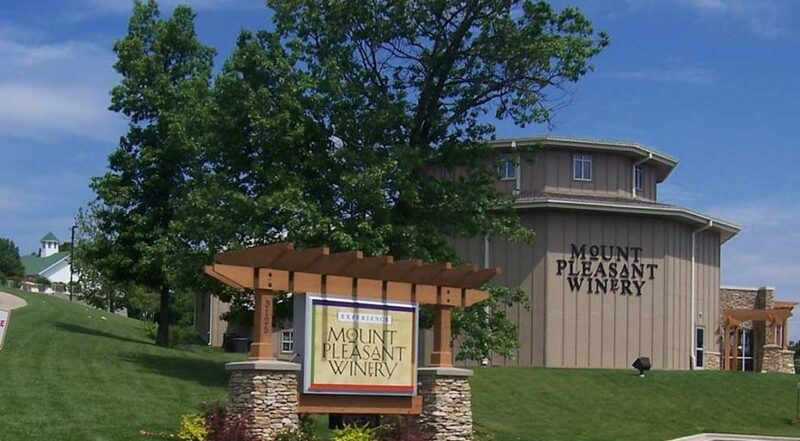 Those inclined to taste Mount Pleasant’s Estate wines, which are only sold online or at the winery, may do so for a $5 tasting fee. Mount Pleasant patrons can even bottle their own dessert wine at the Branson location. Guests can create their own one-of-a kind collectible from a 600-gallon French Oak barrel for the perfect souvenir.